At YouTube.com, you can view clips of many of the films mentioned here. 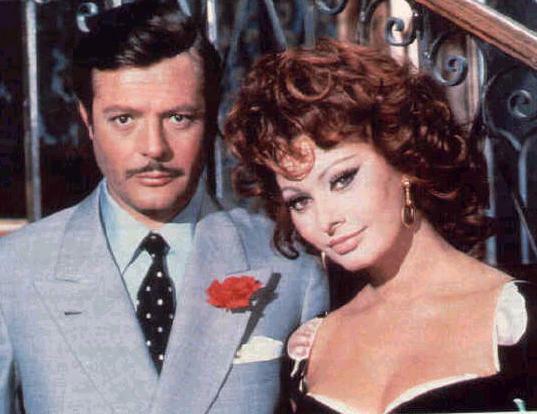 Watch Italian films with a live stream from a Italian TV channels. 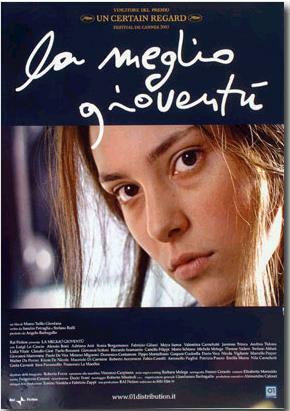 'La meglio gioventù' was made for Italian television (a 6 hour mini-series) but was so accomplished and acclaimed that it is being released around the world as two 3-hour films, that you can view on one day or split over different days. 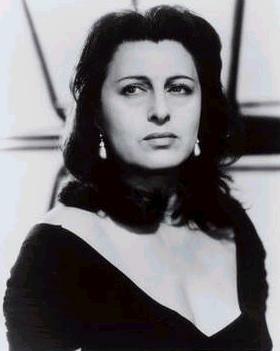 Anna Magnani, the passionate and talented actress, first known outside of Italy in her starring role in 'Roma, citta' aperta' (Open City) in 1945, directed by Roberto Rossellini. 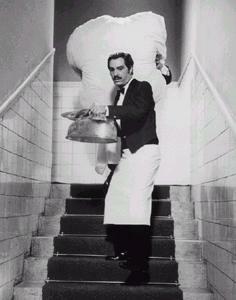 Two images of Nino Manfredi in one of my favorite Italian films 'Pane e cioccolato' (Bread and Chocolate) from 1973. You can get it from Amazon.com. Nino Manfredi received a career recognition award, the 'Prix Bianchi', at the 2003 Venice Film Festival, accepted by his family due to his poor health, he passed away not long after. 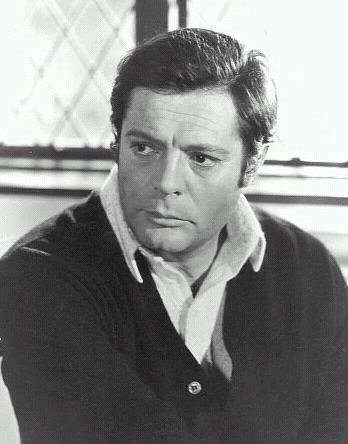 Giovanni Wayne, as he was often called when I first arrived in Italy in the 1980s. Later Italians stopped Italianizing the actors names, unless of course they were Italian-American actors. You can still hear Silvestro Stallone and Roberto DeNiro, for example. 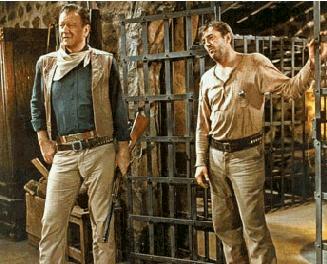 John Wayne and Robert Mitchum, who had different actors dubbing them in this film. But often the same Italian actor would dub a similar sort of Hollywood actor. For example, you'll hear the same voice for John Wayne and Jimmy Stewart in their movies on Italian TV. And the wonderful Marcello Mastroianni. A natural actor, without all the mannerisms of the American method acting style. When asked how he prepared for a part, he said he just made sure he understood the emotions his character was feeling, and tried to portray them as honestly as possible. Performances that touch the viewer, without all the distracting tics. I've put together a page describing some of the top Italian films that are enjoying international release at this time (these are a bit dated now, but the films are still wonderful on DVD). I provide synopses and links to reviews (at Rotten Tomatoes) and film details (at the IMDB) so you can see if you want to make an effort to catch them when they are released near you. Just click here or on the film poster to the left for La meglio gioventù. Many films are set in Italy, even non-Italian films. If you'd like to see a list of them, and even buy some via Amazon.com, the InItaly site offers just that opportunity. Click here or on the film director, to the right, to open their page from which you can select a region of Italy (yes, there are that many films! ), or a director or actor. You can try the ItaliaMia film page, too, to purchase films but also for lots of information on Italian directors, actors, writers, film festivals and associations. Click on the logo below to go to their main site page, and on the link above to go directly to the cinema page. Italian film has a long and illustrious history, and if you click here or on the cup of coffee, to the right, you can read a decent overview of that history. Not all the links on site are active yet, but there's enough about the film eras, stars and directors, to get the picture. The site is all text; a bit dry. A cup of coffee might be a good idea before linking through. Plenty of international stars have made films in Italy over the years, many affiliated with Cinecittà. The studio maintains an informative website but it is all in Italian. It links to many other Italian film sites, again all in Italian. Click here or on the popcorn, to the right, to view an excellent film links site open to the page on European Cinema. The actress Kathleen Turner is one of the international stars who's made a film in Italy, and she swore she would never make another there again because it had been such a horrible experience! Unfortunately, she swore this to an Italian interviewer who then called her "a big fat American cow" in his article (in Italian, of course). 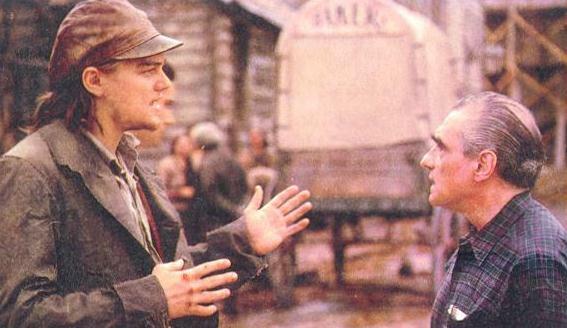 The latest famous fan of the Roman studios is Martin Scorsese who filmed The Gangs of New York entirely on their soundstages. The only complaint he had was the excellent Italian food was making his star, Leonardo DiCaprio, too fat! Speaking of Martin Scorsese and food...it seems that one of the reasons Isabella Rossellini divorced him was, according to her, he wanted her constantly in the kitchen cooking for he and his friends. So it's not just DiCaprio who's a fan of Italian cooking! If you're married to Ms. Rossellini and the kitchen is the only place you want her to be, you must be a fanatical mangiatore, e non di donne! Today, Italian cinematographers have successfully carved a niche in the made-for-television film market. Apparently they own the rights to the Bible, or so it would seem, and have filmed the entire book, or so they claim! The famous Italian director of comedies, Mario Monicelli, explained to a Canadian reporter why Italian films are mostly dubbed. He said the first reason was because most Italian films are made on location rather than on soundstages. The microphones pick up too much of the chaotic Italian street noises to use live sound recording on location. The second reason he gave had to do with the many regional accents and dialects in Italy. A director has to cast for the right look, and the right accent. Because he rarely finds an actor who is right on both counts, he chooses to cast for look, and dub the actor with the right accent later. Another reason is the common casting of European stars in Italian films who don't always speak Italian very well. They don't want to sound anything but perfect, so they get dubbed by someone who sounds just like them if they could actually speak Italian well. This last reason is actually the philosophy that was used in the past to dub Hollywood films. I'll never forget the first time I saw a John Wayne film dubbed into Italian. I was sure John Wayne was speaking Italian! I really had to pinch myself to come to my senses and realize that it was an Italian actor impersonating John Wayne's style of speech, cadence and all, while speaking perfect Italian! "Andiamo al 'corrallo', ragazzi! ", he said as he sauntered off into the sunset, with me watching with my mouth open in amazement. If you'd like to see what Amazon.com has on offer for Mr. Manfredi or Ms. Magnani, or any other actors, directors...you can search here. Just enter 'DVD' (or VHS) in the 'Search' field, then 'Anna Magnani' for example in the 'Keywords' field. Then click on the 'Go' button to get a list of DVDs with comments and prices. Here are a few direct links to some fine films. Check out my page dedicated to the Italian actor Terence Hill. From there you can link to his Official Website in Italy. I've a story about running into Italian actor Francesco Nuti. I learned a valuable lesson about fame. 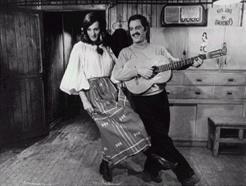 And click here for a grappa, Anthony LaPaglia, Betsy's Wedding story.